The range of products is listed below, in descending order of "strength". Click on product below to see product details (as would form basis of Point of Sale Information etc), discounts for multiple case orders of individual coffees, and to place an order. 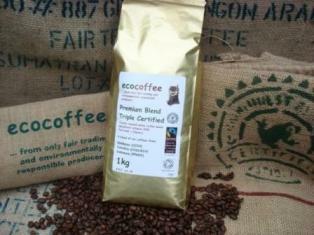 Or you can call 01342 833723 or email orders@ecocoffee.co.uk with your requirements. We can supply table/menu point of sale information if required, or you are welcome to copy it off the website. 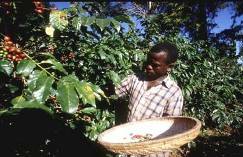 Our feedback is that this information about the particular producers is a valuable part of their customer's experience and creates a real interest in the coffee. The coffee beans are packed at the optimum time after roasting in airtight kraft finish packs incorporating a one-way freshness valve, allowing de-gassing of the beans but protecting the coffee from environmental factors, namely oxygen, humidity and light. This preserves the premium crema quality, rich aroma, and the fragrance and taste of freshly roasted beans for many months. All packs display a “Best Before” date. Once the pack is opened, the beans should ideally be used within a week or two. N.B. The Premium Blend coffee is blended specifically for foodservice requirements, being especially suitable for both pure espresso and espresso based milky coffees, but also as a longer black coffee. FULL (5): "Great as an espresso and bold enough for the flavour to cut through milk." FULL/MEDIUM (4) ; "Something very special! Immediately spicy to taste with caramel notes and a long lasting finish. Perfect for either espresso or any milky based drink." 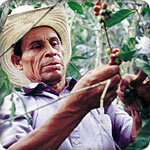 FULL/MEDIUM (4) "A rich complex coffee, subtle floral acidity. A great mocha coffee. OCFCU coffee as in 'Black Gold' film." MEDIUM (3) "One of the world's most popular coffees. This coffee is very bright and lively with good body and balance." MILD (2): "A bright clean nutty flavoured Colombian decaff. Good body with a smooth finish."